Blog Home » Make Brushing & Flossing Fun: 4 Ideas that Work. One of the easiest ways to make brushing fun is to indulge your kids with a themed toothbrush. You can find tooth brushing gear with everything from Sponge Bob to Finding Nemo and even comic book characters and superheroes. Always pick one with soft bristles and with a brush size that is appropriate for their mouth and age. Giving your child an opportunity to choose her own toothbrush empowers her to be an active part of maintaining positive dental habits. Use toothpaste made for kids. There are a lot of flavored toothpastes on the market that can help to make tooth brushing less “icky” for kids who don’t like the strong mint or cinnamon flavor of adult toothpastes. This is another opportunity to involve your children by letting them choose their toothpaste flavor. Of course, always make sure that toothpaste is approved by the ADA and carries the ADA seal. Make brushing a family affair. Make oral hygiene a family activity. Toddlers love to imitate their parent’s behavior. The same instinct that leads your children to play dress-up in your closet will make them want to take care of their mouth just like you do. 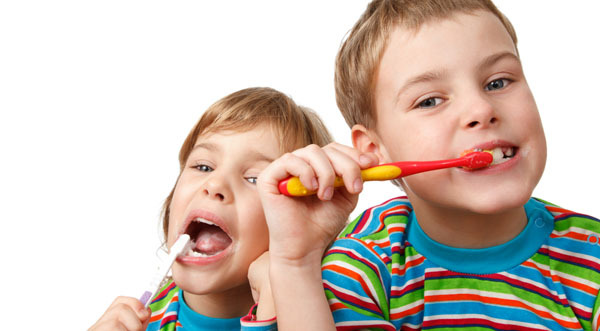 Practicing good oral hygiene together will also give you the chance to notice any issues that your children might have with their brushing technique. It’s important that they don’t brush too hard, and that they don’t miss tricky parts of the mouth like back molars, and under the gums. Remember to help your child brush at least once a day until they develop the fine motor skills to do a good job on their own. Use music, apps or video. Music is also a great tool for any repetitive activity. Humming a favorite song together is a good way to ensure that your children are brushing their teeth long enough to thoroughly clean them. The American Academy of Pediatric Dentistry recommends that children brush their teeth twice a day, for two minutes per session, which can seem like an eternity for a restless child. Using music makes this time pass quicker and can even serve as a way to measure how long teeth are being brushed. Oral care is a repetitive activity that benefits greatly from a little bit of music. Ultimately, the goal is to make oral care fun. Just because it is a habit, doesn’t mean it also has to be a chore. We would love to hear your ideas about how you’re making brushing fun in your home!